The room was packed with students from PBSC’s Automotive and Diesel Service Technology programs. One student received a scholarship, but all of them left with something valuable: advice from an industry pro. 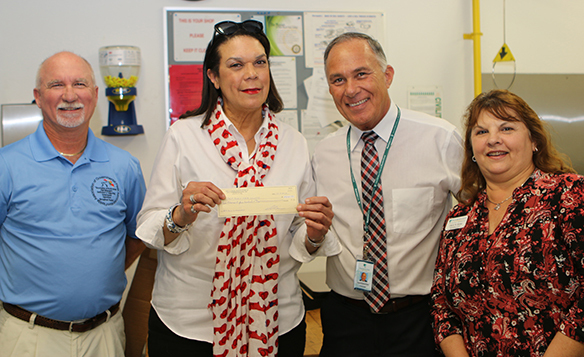 Tim Calhoun, fleet director for Palm Beach County Fire Rescue, presented Palm Beach State College with a check for $2,500 Monday on behalf of the Florida Association of Governmental Fleet Administrators. It was the second half of FLAGFA’s $5,000 scholarship gift that represents an ongoing commitment to the College. 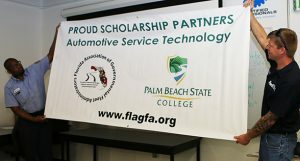 FLAGFA provides PBSC and five other state colleges with $5,000 scholarships at regular intervals, which it plans to continue for as long as possible. The organization’s goal is to promote student success as well as awareness of the excellent career paths offered in government fleet services, where there is a growing demand for technicians to repair and maintain the vehicles used by police, emergency medical services, fire departments and other government entities. As past president of FLAGFA, Calhoun presented the check on behalf its current president, Sean Williams. 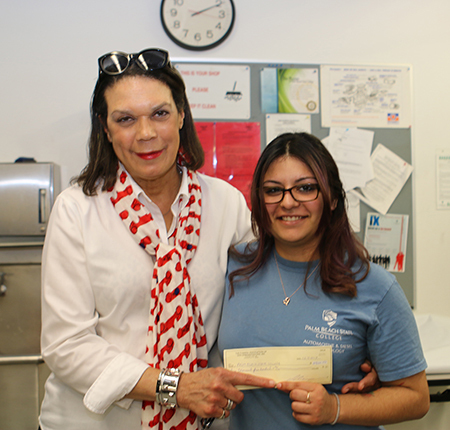 The scholarship check went to Mireya Gonzalez. She graduates from the Automotive Service Technology program next month and has already accepted a position at a local auto service center. After the check presentation, Calhoun advised the students on how to best navigate their career journeys: Be reliable, have a positive attitude, pay attention to detail, keep learning, stay physically fit and consider a fleet career if you want a clean, safe work environment, quality of life, and good health and retirement benefits. Two graduates of PBSC’s Diesel Technology program unfold the special banner given to PBSC (from left): Norris Rhoden, apparatus technician II for Palm Beach County Fire Rescue, and Patrick Calhoun, senior vehicle technician for FedEx. Pat Richie, dean of Business, Trades and Public Safety programs, was among the PBSC staff and administrators who thanked FLAGFA for its support and Calhoun for his presentation. Learn more about PBSC’s Automotive Service Technology and Diesel Service Technology programs.